how does a child REALLY learn to write? Mr. T is just beginning to type his writing on his own. Warning: some of what follows may sound like heresy to traditional educators. There are so many good questions here, enough to fill a chapter in a book. Rather than try to address this reader’s wonderings in an elegant, cohesive way–which would have me tapping at my computer here for days–let me offer instead some random thoughts. The notion of learning through routine practice is mostly a school notion. Practicing small pieces of a larger skill day after day is a way of ensuring that a large group of children will eventually learn that same skill. The assumption is that the child will learn the multiplication table, or the rules of grammar, or the parts of the body if he or she works at them repeatedly. The teacher can’t be aware of learning that happens outside of the classroom, in daily life, so all learning gets focused into a lesson format. Many of us who grew up going to school have unwittingly become convinced that a person needs this sort of routine practice in order to learn something. Adult-driven, routine practice-type learning rarely takes the child’s interest and motivation into account. In fact, in most cases, the child isn’t terribly engaged in this sort of practice. He or she does it simply because it is required. On the other hand, when a child’s interest and motivation are there, that child can often pick up concepts and skills rather quickly. Repeated practice isn’t necessary. Your daughter figures out how to multiply mentally because she wants to win at Yahtzee; your son understands how different ancient civilizations affected one another because he enjoys reading The Cartoon History of the Universe. This is not to say that repeated practice doesn’t have a role in learning. Repeated practice when taken on by choice can be the deepest sort of learning. When, for example, a child does that skateboard trick over and over to get it down; when she draws manga characters in the margin of every paper in her path; when she keeps strumming her guitar because she wants to be able to play Hey Jude through the finish. The child learns in these situations because he or she is motivated and the engagement is constant. In this case, practice leads to deep learning, yet it doesn’t feel like practice to the child. The child is simply doing what he or she is compelled to do. So, how do these ideas apply to writing? I don’t believe that a child needs to write daily, or even (gasp!) weekly to become a skilled writer. I’ve developed this radical notion by watching my own kids learn to write, and also by working with dozens of homeschoolers in writer’s workshops for over twelve years. Many of the kids I’ve worked with didn’t practice writing formally on a regular basis, yet most became effective, expressive writers by the time they reached their teens, and often well before. When a child is interested and engaged in his or her writing, the experience is rich, as my reader notes above. It’s like a piece of good, dark chocolate: a little goes a long way. The child learns enough from the experience that it doesn’t need to be replicated on a daily or even weekly basis. Allowing the child to focus on topics and genres of interest will naturally help that child develop the “authentic writing voice of one’s own” that my reader wonders about. This, I’d argue, is the most essential writing skill of all. Writing skills are based in thinking and speaking skills. Believe it or not, kids can develop as writers without writing at all! If they live in a home where people talk, discuss and debate–especially on topics important to the kids–those kids will learn to express themselves clearly and passionately. And this verbal expression will carry over into written expression. Even kids who are not terribly verbal, but are quite logical, can naturally develop into strong writers if they understand that clear writing follows from logical thinking. Understand, dear readers, that I came to these ideas slowly. I’ve been homeschooling for almost fifteen years, and have sent a kid off to college. I’ve been teaching myself to write for even longer. These experiences have gradually shifted my thoughts about writing. Still, I remember being the first-time parent of a young child. I had so many concerns about preparing H for what he would need later. Even though things seemed to be tootling along fine most days, it was often fear of the future that became the gravel in the road. I wrote a bit about those worries in this post. If you’re concerned about helping your kids develop writing skills for their futures, I have a few quotes for you. “Throughout the year, your goal is to transcend the formulaic five-paragraph essay model—the one that you have probably relied on in other courses that required you to write essays—the essay that depends too greatly on a reductive thesis-statement and a limited scope of evidence. Do you see what I’m getting at? Both of these college professors value creativity and thinking in writing. Newkirk recognizes that a love of words and time spent with them is what teaches a student to write. H’s professor values deep thinking and personal insight. They’re less concerned that students know formal rules and formulas–H’s professor says the goal is to transcend those formulas! But, you ask, what if the students don’t know how to funnel their love of words and deep thinking into an essay? Well, that’s what these college courses are designed to teach. Bottom line: kids don’t need to learn how to write formal essays at age ten. Especially if formulaic instruction is replacing meaningful, authentic writing. Talk about what interests them. Let them go on and on about ballet or Roman legionaries or Smurfs if that’s what excites them. Ask questions. Let them explain in intricate detail. Debate them, gently, on fine details if they enjoy defending their beliefs. This is how they’ll develop the skills of explanation and argument, which will eventually factor into their writing. Make the distinction between getting-words-on-the-paper skills and written expression. In other words, remember that learning to form letters and spell words are not the same skills as developing a voice as a writer (the more important skill in the long run.) Help make the mechanics of writing as easy as possible for your child. Let those getting-words-on-the-paper skills develop slowly, ignoring public education’s timetable for those skills. In the meanwhile, explore dictation as a means of developing your child’s written expression. Explore intriguing nonfiction. Rather than pushing dry reports and formulaic essay-writing, search for well-written nonfiction on your kids’ favorite topics. Unlike formula-bound essays, good nonfiction writing employs the tools of fiction; it engages us because it tells a story. (Consult that syllabus from H’s English professor.) Fun books like You Wouldn’t Want to Be a Roman Gladiator! teach both content and writing style. The writing and photos in Theodore Gray’s The Elements transform an overwhelming topic into a box of treasures to discover. Let these types of nonfiction serve as models for your kids. You can read more about helping kids find nonfiction topics based on their interests in this post. Excellent inspiration: Wacky We-search Reports by Barry Lane, which provides fun alternatives to dull report-writing. Bonus: it’s written directly to kids. Help your kids find meaningful, authentic reasons to write. Writing because Mom or Dad thinks it’s a good idea is not a meaningful, authentic reason! Generally, we write to communicate with others. We write to connect. (Unless, of course, we find fulfillment in personal writing such as journaling. If you have a journal-loving kid, value that! See Newkirk, above.) We write, very often, because we’re seeking a response. Find real writing opportunities that engage your child and invite response: letters and e-mails; family newsletters or blogs on shared interests; signs and props for make-believe play; displays of favorite collections to share with friends and family; rules for self-designed games… Make opportunities for your kids: host a writer’s workshop; organize a science fair or a history fair; form clubs based on their interests: oceanography, insects, rock and roll music; help them gather a group of friends to write a baseball newsletter; form a team and create a homeschooling yearbook. (All examples of actual activities organized by my family’s homeschool support group!) If you don’t have enough local opportunities, use the Internet: find opportunities for your kids to write on websites of interest (all three of my kids have done this in various ways); set up group blogs or wikis; let your kids explore online forums if you think they’re ready for it; look for fan sites based on their passions; allow them to post reviews on music or books or films; check out the community for teen writers at figment.com. There’s much more to say here, and if there’s interest I can write further posts on the topic. But know this: kids who have real, meaningful reasons to write will want to write, and will continue to write. Hoo-wee! Nothing like cramming an entire writing philosophy into a single blog post! I’m not even sure that I addressed all of my reader’s concerns, but it’s a start. Help me out, would you? Let me know what you think? Tell me if there’s anything here that you’d like me to explore in a future blog post, or if there’s any of my heresy with which you disagree. Maybe we can tease apart these writing notions a bit more slowly, so you don’t feel as if you’ve been whacked across the head. Let’s talk about how kids really learn to write. 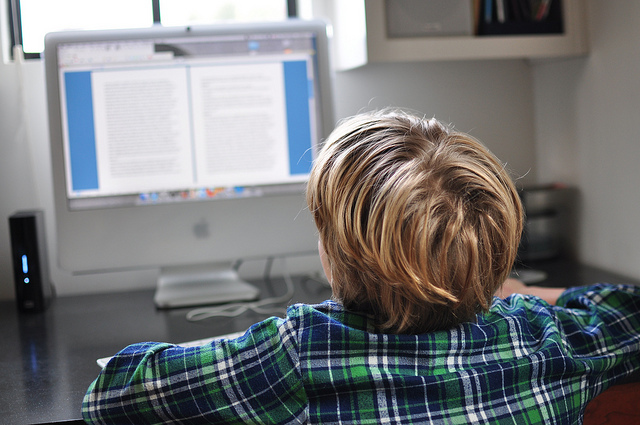 I homeschool my 7 year old son as school is quite difficult for him, especially the work part, and writing. He was recently diagnosed with ADHD but I’m not quite buying that label. Dictation is the only way for him to get his thoughts down. If I have him write on his own it’s short, choppy, not much to it. If I offer to be his secretary then bam! I get the whole scoop. He loves to draw and add speech bubbles and make signs on post it notes; that’s writing in my book! His teacher at school, however, expects something a little different! I truly think he gets bored with the read a story do the workbook pages format. Yawn! He would rather look at National Geographic, listen to Magic Tree House books on CD or “read” his civil war books. Now were getting interesting! Your thoughts also inspire me as a teacher (grades 4-6). We are required to teach several different essay formats (persuasive, narrative, etc). So many of my students can’t think of what to say! The time they had the most to say was when I had them write a persuasive piece about why they should get more recess. They actually came up with some convincing ideas (we need to get our energy out so we can focus on learning and the teachers need more time to eat and prepare) that were presented at a staff meeting. They now have a longer recess twice a week! Why did they write so well and have so much to say? Because they cared. It mattered to them. Why would you write about anything else? It must be a challenge to have one foot in a classroom, and one at home, Wendy. But it sure sounds like you and I are of similar minds! I love how dictation allows you to “get the whole scoop” with your son. Speech bubbles and Post It note signs sound just right for a seven-year-old who is learning the mechanics of writing. I’m just sorry that more teachers don’t agree. And the recess essays! Perfect evidence of how authentic topics matter in writing. Hope you can help your students find other meaningful, authentic topics as you work through the different essay formats. If you have to teach formal lessons, the closer you can get them to the kids and their interests, the better. But I’m sure you know that! What a wonderful post! This is how I approach writing with my kids (8 and 11) too. When we started homeschooling, my son made me promise NOT to use any textbooks. He was so burned out on the traditional educational system. With the exception of math, I have agreed to this, and we do a lot of things you suggest. My kids learn writing skills by reading well-written books, both fiction and non-fiction. When I do give them writing assignments, I try to give them real-life goals instead of a letter grade. For example, I had my son enter a writing contest on leadership last year; he interviewed his favorite leader, wrote an essay about him, and the presented in front of judges. He ended up winning a hefty cash award. This year, he did such a good job with a modern-day Canterbury Tale I assigned him, I sent it off to Creative Kids magazine to see if they would publish it. They accepted his piece, and he’ll be published later this year! That kind of recognition is so much more meaningful than any grade I could give. We started dictation with my daughter when she was 6, and I had her participate in National Novel Writing Month to create a story. Over the months, I taught her how to edit and illustrate her work, and then sent it off to a self-publishing site; this allowed her to have a professional looking copy of her own book! She was so excited by that experience that she has devoted her last two years to writing and publishing more books. She now has two available for purchase, and two more in process. She has toured and promoted her books too, making enough money to purchase plenty of book stock and her own laptop computer. Now she’s produced short videos talking about the craft of writing so that she can inspire other kids. She put them up on her website, http://www.evaridenhour.com. All this has been so fun; public school teachers are inviting her to guest speak to their 6th grade students! Each year she dictates a little less and takes more of the actual writing process on herself. She’s only 8, and identifies herself as an author. No 5-paragraph essay could have ever done that. What amazing, meaningful writing projects your kids have done, Gwyn! Your daughter’s books and website are utterly awe-inspiring. She’s living proof of the power of dictation to help a child find her writing voice, and I just love that. You don’t have to do all of your own writing to be an author! Readers, if you haven’t seen Eva’s videos, check them out! Thanks so much for sharing, Gwyn. I am so grateful for this post. I think I need to print it out and put it where I can see it often. I really do believe that the sorts of “incidental” learning you describe work for kids (adults, too). I’ve seen that firsthand with my own children, so I don’t know why I have such a hard time trusting that my kids can learn writing this way, too. Perhaps it’s just that writing is something I love and enjoy so much, it’s hard for me to understand why my kids don’t want to write more. I think I’m fine with waiting for their interests to kick in–as long as they’re not too “behind” the school schedule. I start to get antsy when their skills don’t seem to be keeping pace. I’m reassured that my kids do live in the kind of literacy-rich environment that you talk about in your post–we read aloud, play word games and make up goofy rhymes on the fly, talk incessantly about books and movies (and in my son’s case, video games), discuss issues of the day, dissect advertising and marketing messages. I would guess that even though my son can barely spell and knows very little about punctuation rules, his literary analysis skills are way ahead of many of his school peers’ skills (and even some college students I’ve taught, frankly). So hopefully things can even out over time–it’s just such an unconventional path compared to how I was taught. The part that I’m finding most difficult is the waiting for kid-motivated writing projects to happen. I try offering a lot of the things you talk about–taking dictation from them about whatever interests them, helping them set up a blog, etc. I’ve even tried encouraging my son to play video games like Minecraft in the hopes of sparking writing through game-related online chats with his friends! But I think deep down, I’m not offering these writing opportunities to help them explore THEIR interests; I’m offering the opportunities to try to accomplish my goal of having them write. And I think they sense that and shy away. On the plus side, I am going to start a writing circle this month for kids in our homeschool group, ranging in age from 6 to 12. We’ll have some writing prompts for the kids to try and time for kids to share work out loud if they want to. The younger ones will dictate ideas to grown-ups while the older ones write more independently. I do hope that my kids will find inspiration in having an audience and hearing the other kids’ work, but more than anything, I started the group because I myself wanted something fun and energizing to do to get me through the end of winter in Minnesota. I’ll keep you posted on what unfolds! So much good stuff here, Carrie. Oh, these kids: they pick up on our intentions right away, don’t they? I know my kids have always evaded projects if they sense it means a lot to me. There’s no way out if they start, you know? I realize that there’s something else I didn’t mention in my post. With the kids I’ve known, I’ve seen that kid-motivated projects often really kick in when the kids are preteens. Which isn’t to say that it doesn’t happen sooner for many kids–which is why it can’t hurt to try to offer opportunities earlier, so long as we don’t push too hard! But if you think about it developmentally, it makes sense. As kids get older, their peers matter more and more. So peer-related writing opportunities can become more motivating as kids get older. Your writing circle sounds wonderful! In that type of activity, the kids tend to write for each other, and not for their parents, which is really what you want! You may want to give them the option to share work from home at some point; I’ve found that some kids struggle more with writing on-the-spot, and appreciate having opportunities to share something they’ve been able to spend more time on. Your kids are growing up in such a richly literate environment. Someday you’ll be sending me an email telling me that you shouldn’t have worried, I just know it! One thing I did with my kids was simply make a bunch of small hand-stitched blank books with six to ten pages in them. I left them in a bowl on the kitchen table (yeah, some families have fruit bowls . . .) and left out some pencils and markers. Every member of our family wrote in those books — Dad did a book or two, I did some, and each kid did many. When we filled in a book, we put it back in the bowl. Thus, at breakfast we were as likely to be reading books by family members as we were whatever other reading material was around. This was a great incentive to write. My kids are in first and fourth grades now and both are dedicated writers. The bowl is off the table . . . but I think maybe I’ll reinstate it. I’d love to have the small hand-stitched evidence of where their imaginations are taking them today. Love the idea for your bowl of books, Linda! The notion of a bowl of blank, hand-made books is enticing to begin with, but I think the fact that you and Dad wrote too just may be where the magic is! There’s no better way to inspire a kid to write than to join them in their writing. Especially if everyone does it at their own pace, and their own motivation. So pleased to have a writer chiming in here! I poked around your blog, and loved reading about your family tradition of Read at the Table Night! That’s a good one. Nice to meet you! Truly, this is a gift to us all. Thank you for the time and tremendous insight you brought to this post. I loved the excepts from the professors – oh may those words guide us all. I’ve watched my daughter gain tremendous confidence this year in her writing (which has brought her mother much joy and feelings of gratitude). Dictation has and continues to be a wonderful path to this end. I can’t wait to try some of the audio books that were suggested. Again, thank you for your time. Thanks so much for the kind words, Cari. I’m always thrilled when I hear that dictation is helping a child become a writer! 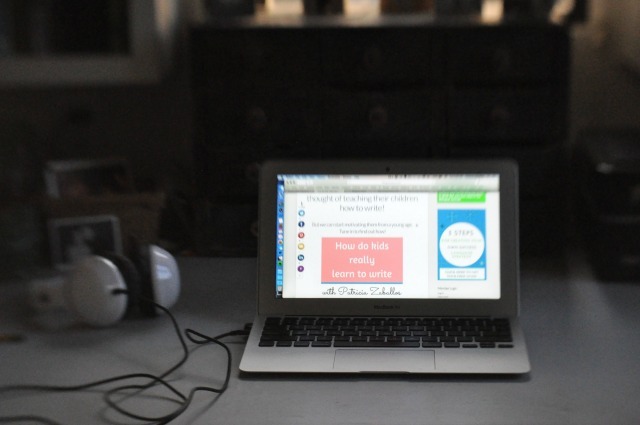 I was going to write about homeschool writing at FIMBY but you just did it for me. My philosophy, experience everything seems to be summed up in this post. Thank you for taking the time to put this together. How you ended: But know this: kids who have real, meaningful reasons to write will want to write, and will continue to write. so, so true. Hoo-wee, nothing like reading an awesome post to get my homeschool juices going. So glad that the post was meaningful to you, Renee. Especially because writing is becoming an important focus for you these days! It’s always so nice to hear from you. Tricia, this was a fabulously rich post! I found myself both nodding in agreement from experience (both as a former teacher and an unschooling mom) and feeling validated and encouraged by seeing the truth of our experience written down. Sometimes I really don’t trust that I know something until somebody else spells it out for me! So thanks, Tricia. My 17 year old wrote hardly at all but grew up in a household full of discussion, debate, literature and content. When, at about 15, he wanted to write, lo and behold, he really knew how to put words together. He knew how to think and speak clearly from years of doing just that. It translated perfectly well to paper. The mechanics of writing (especially the ridiculousness of English spelling) were something of a stumbling block but those are getting rapidly better with time and experience and they seem to be coming together in far less time than if he’d been studying them or practicing them for years. He just finished English 1A at the community college with an A (and didn’t need to take remedial English). Just offering that up as proof that needing to practice writing regularly and from a young age is just another urban legend. I’m thrilled to see you here, Pam! I realize that my post didn’t focus much on the notion that kids who rarely write, but who grow up in literate environments, can become effective writers quite naturally in their teen years. I’ve seen that with many kids and absolutely believe it–for many of the reasons I’ve stated above. I definitely thought about S. when I wrote my post! Thanks so much for sharing his story here. I know that newer homeschoolers gain so much from hearing from others who have gone before. I’m going to forward your response to one unschooling mom in particular, who has been worrying about her kids and writing. It will be helpful to her, I’m sure! Definitely okay to repost! Spread the word! Well said Patricia. You just wrote a precis of your own blog! For those of you with children in the school system, I have a 7 year old who gets quite a few writing assignments that (IMHO) are not age appropriate. I provide the “scaffolding” (as teachers like to call it) by talking about what she would like to write and providing the vocabulary for her before she begins the exercise. Some parents may think this is “cheating” but I believe it makes homework much less frustrating. Besides, she writes PLENTY on her own – the lyrics from a favourite Christmas carol; signs for imaginary candy stores; comics and letters…far more interesting than book reviews. So glad that you gave a parent-of-school-kids perspective, Peaches, because I know many of my readers aren’t homeschoolers. Even if your kids go to school, you as the parent are their most important teacher. Understanding that scaffolding isn’t cheating is an important part of that. I’m so glad that you understand that! And I’m glad that you recognize that lyrics and signs and comics are wonderful and totally appropriate examples of 7-year-old writing. Good stuff, both of those books! (Actually, there are several volumes of Cartoon History.) Cartoon History and Wacky Research compliment each other nicely. CH is a perfect model of the sort of writing that Wacky Research suggests! Thanks, Nancy! Pam, I want to second Patricia’s thanks to you for sharing your story. I’ve seen the phenomenon of my child learning very quickly once he’s ready and interested. At 7, he went from not reading as far as I could tell to reading fairly advanced material fluently and with expression, all in just a few months–and all thanks to his desire to read Garfield comics independently, not exactly what I expected to be his “trigger,” but there it was. Before that, I think we’d laid a lot of groundwork by doing the kind of enjoyable activities Patricia writes about–listening to books on tape, reading out loud, discussing, playing word games. When he did start to put print together into words and sentences, he already had a rich inner library of sounds and associations to call on. So I’m hoping that by the time my now 9-year-old son is your son’s age, I’ll be able to look back and see how everything did eventually come together for him when it comes to writing, too. Thanks again! That’s how learning works when you let it. Thanks for sharing, Carrie! another amazing post! i get frustrated waiting for the writing to start and be more regular, but my kids do grown up in a rich environment with lots (and lots) of talking, reading, debating, organizing, and performing. some things they really like are making comics, making fake newspaper front pages, emailing, writing letters to mail in the real mail, and using ads to make lists while organizing parties. Don’t forget making their own Lego sets and writing protest posters! The rich environment and small writing projects will make writers over time. They really will. This is so timely for me! I was so excited when I clicked on, it’s just what I needed. Thank you for this inspiring and encouraging post. All the above comments and responses were great too. I especially agree with Carrie who said that she should print it out and read it often. It is so easy to lose sight of trust when you are constantly being referred to standards and ‘where they should be’. My daughter is a homeschooling 11 year old with a great sense of humor and the literature rich environment you describe. She reads all kinds of things and has no trouble at all writing notes, letters, poems (we love Rip the Page and Poemcrazy), lyrics, really all kinds of stuff that she comes up with. It’s only when it’s assigned or has a certain format to follow that I lose her. I will continue to trust – thank you! So nice to meet you here, Nona! I’m glad the post has been helpful. The comments are wonderful, aren’t they? Rip the Page and Poemcrazy are two of my absolute favorite writing resources! If your daughter is enjoying writing ideas from those books, then she no doubt understands the joy and power of words. And that’s all she really needs to keep going. Such a wonderful post Patricia. This is the path we walk with writing. Here we are just heading into a new year after the Summer holidays. As most children disappear back into the school room, I often feel a lull in passion and direction. Your post spoke directly to my passion and belief in child and interest-led learning. Thanks for that, you’re a gem. Perhaps the post will also give me the juice to get writing again at my own blog. So glad that the post was helpful, Jacinda. And I hope you do get writing on your blog again–so we can read it, yes, but also because there’s no better way to inspire kids to write than to write ourselves! Excellently written post Tricia. I like how it’s all summarized so nicely. I was thinking about what you had written, and being a visual person, I imagined that it would be really cool if you could get H to help you make a reenactment of the things you are writing about. Images would make what you are saying real. I mean no disrespect with regard to the clarity you’ve clearly demonstrated in this piece. It’s just another take. Use your words in combination with footage to show us what you are talking about in action. Part of the trouble of having H help me is the little fact that he lives clear across the country! I was hoping to have him film part of a writer’s workshop, so I could have a very short film of the kids in action, reading their work and giving feedback to each other. But even if H were here at the right time and could do the shoot for me, it’s the editing process that’s so time-consuming. Even for a very short film. As you know! It would be really neat to have some of these experiences on film, though. I agree! And, can’t wait for your book! I’m honored to receive one of your rare comments! I know the feeling of struggling between what I learned as a teacher, and what my kids have taught me. It took me a long time to make the shift, and to have faith in what we were doing. Many folks assume that homeschooling must be easier for former teachers; I think we often have the most adjusting to do! So many truths in your post, Tricia. Through unschooling, I have learned to truly trust my kiddos. I often watch with amazement as they take on new aspects of learning. My kiddos will create elaborate stories if I take on the role of stenographer. When left to write themselves, they lose interest. It is hard to write all you are dreaming and thinking when just getting the words down is a challenge. I so heartedly agree that a literature rich environment complete with intellectual discourse helps craft the writer. Thanks again. So glad that your kiddos are teaching you what they need as writers, Heather. Sounds like they have it all figured out! Here’s to the art of stenography! Great article. H’schooled my two sons, one of whom has his PhD, so completed the writing of a scholarly dissertation. The other is in advertising and knows how to turn a phrase into something special. Thank you so much for sharing your sons’ experiences, Lucida. I know that stories like yours are incredibly reassuring to newer homeschoolers. I absolutely agree that reading great writers is the very best way to learn to write. So fantastic to hear about grown homeschoolers and the interesting lives they make for themselves! Thanks to dictation, my six-year-old daughter has been able to participate in a writing group I’m doing for our homeschooling support group, even though she doesn’t write independently very much yet. She “brainstorms” while other kids are doing in-class writing by drawing pictures of her ideas, and then later she shows me the pictures, we talk about her ideas, and she dictates poems to me based on the pictures. Another boy in our group has been doing something similar. Without Patricia’s influence, I don’t think I could have envisioned how to include these younger “non-writers,” but now I really see my daughter’s interest in writing really taking off, as well as her confidence about being part of a writing group. She wants to keep a daily journal–still dictated, mind you–and is planning a travel journal for a multi-state trip we’ll be taking this spring. Tonight she and I were playing an oral storytelling game: I’d draw three cards with words written on each, like “wolf,” “belly dancer,” “cave,” “key,” and so on. She’d make up part of a story based on the words, and when she got stuck, we’d draw three more. She seemed to really enjoy it and have lots of ideas. I’m feeling excited about sharing writing and a love of words with her, and interested to see where it will lead. Thanks so much for sharing this, Carrie. Becoming a writer can be such a different process, I think, if we begin with the child’s voice and ideas, and move into the writing mechanics later. Your daughter is able to develop her ideas on the page in a way that’s fun and developmentally appropriate, and then she gets to share them with an audience! Of course she’s hooked, and of course she’ll keep going! I have a new post on writer’s workshops up. 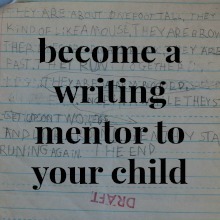 Hope you’ll chime in and share–again–how your writing group is encouraging your daughter! Hi Sandra! I’m so glad that this post speaks to you–and I envy you at the beginning of your homeschooling journey! I know I’ll remember mine as some of the best years of my life. You have lots of good ideas! Organic and authentic–absolutely. This post is a few years old. I wrote sections on a book about writing for parents for a few years–and there are many posts here on that topic–and then decided that I really missed essay-writing. So I’ve switched gears and am at work on a memoir of our homeschooling days. I did end up writing a short book on facilitating writer’s workshops. 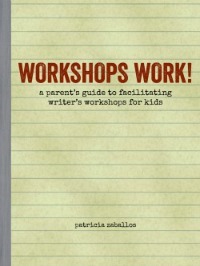 Whether or not you read my book, I highly recommend writer’s workshops! Maybe do a little research, and keep that idea in your back pocket. Thanks so much for saying hello. Best of luck to you and yours!